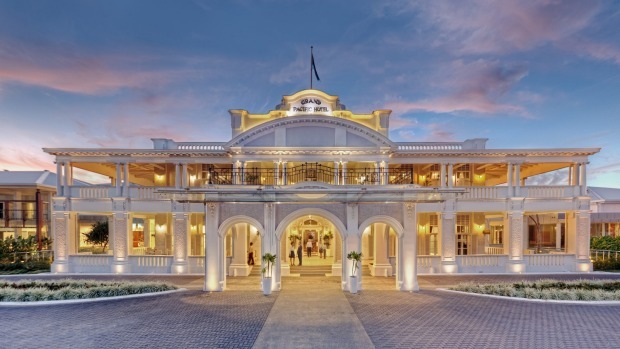 The Grand Pacific Hotel, Suva, Fiji, is a fine example of colonial history. It is hard to imagine a more surreal romantic buzz kill than having photos of your grandmother staring down at you from the bedroom wall – wearing a crown – when you are on a tropical island on the other side of the world. There was, however, no escape for Prince Harry and Meghan – now their Royal Highnesses, the Duke and Duchess of Sussex – when they arrived at the Royal Suite of the Grand Pacific Hotel in Suva in October. The sumptuous suite is lined with photographs of the Prince's relatives on previous visits. The Queen has visited the hotel three times and there have been seven state functions in honour of members of the British royal family, going back to the 1927 visit by Duke and Duchess of York, who would become King George VI and the Queen Mother. When I visited the balcony at the front of the hotel, it was still freshly trod (and painted) from where the Duke and Duchess stood and waved to the crowds in the football field over the road, just as his grandmother had done 65 years earlier in the months after her coronation. Ocean views from the hotel, which is still a place where a writer can catch the breeze on the verandah and be inspired. "If we are going to be technical about it and include the unborn baby," says general manager Peter Gee, "we would say we have hosted five generations of that family." It is hardly surprising that the royals keep returning, the Grand Pacific – or GPH – is a reminder of the good old days (Royally speaking) when the sun never set on the British Empire and Britannia ruled the waves. 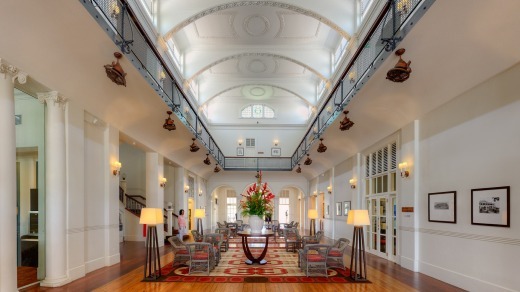 With it's wide verandahs, wicker furniture and wooden floors it is a fine example of colonial history. The sort of place where adventurous chaps washed up on the trade winds and drank G&Ts in panama hats and linen suits at sunset. Built by the Union Steamship Company and opened in 1914, the GPH is a place whose old-fashioned elegance attracted writers travelling the south seas. 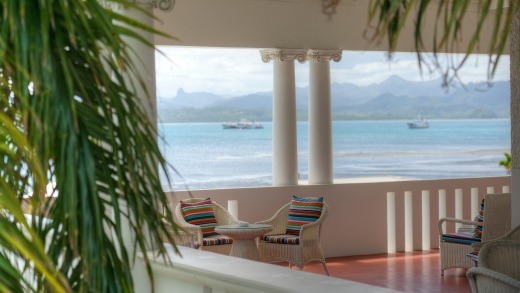 Noel Coward was photographed in the lounge in 1962, Somerset Maugham gazed across the manicured lawn to Suva Harbour and the jagged forested mountains in the distance. "Out there," he wrote in A Writers Life, "you feel there is a strange and secret life ... Aboriginal and darkly cruel." 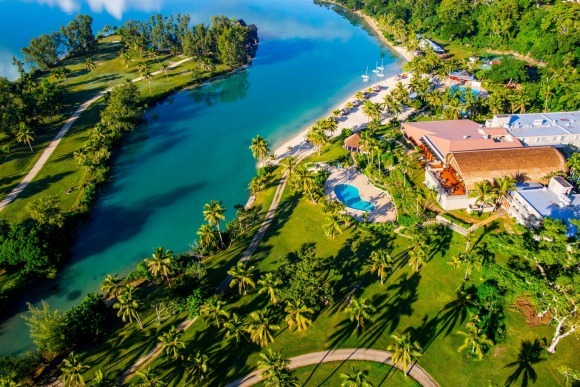 Maugham detailed the ex-patriots who had come to Fiji filled with ideas of romance but instead spent their days drinking steadily in the bar of the Grand Pacific, "bored, lonely and disillusioned". Alistair McLean however found it far more exciting, his protagonists are kidnapped at gunpoint in their room in The Dark Crusader. "The locks on the bedroom doors of the Grand Pacific Hotel were just no good at all." James Michener had first visited when he was a Navy soldier during World War II, and would return on a kind of pilgrimage, writing in The World Is My Home (1992) that it was "one of the more memorable hotels of the world, not majestic and not particularly spacious but a haven to all who cross the Pacific ... it was grand, and it certainly was pacific and the barefoot Indians who served the meals had a grace that few hotels in the world could offer and none surpass." Peter Gee gets contacted by people who have discovered parts of the hotel's past, such as someone who had been going through their father's stuff and found a menu from 1945 that had been kept all his life. Sir Charles Kingsford Smith came to stay on his historic flight in 1928. He had only two gallons of fuel left when he landed. During the '90s the hotel went into decline after a number of ownership changes and sat derelict, boarded up and rotting for 23 years. It reopened five years ago and now blends efficiency with a conscious effort to preserve its past. "Most hotels aren't like that now, they have become sanitised," says Gee. Today it is still a famous hotel – it's on the $10 Fijian note – still a place where a writer could catch the breeze on the verandah and be inspired, if only they could afford it. You could wind up sitting in the same seat as Maugham did when he got talking to sad teachers and disgraced insurance men at the bar. "This is what the South Pacific is all about, I think" says Gee. "It is not palm trees and white sandy beaches, it is trade winds and mountain ranges. Every aspect of this hotel's history is fascinating." Susan Chenery stayed as a guest of Pacific Island Productions. Prince Harry and Meghan Markle during their stay at the Grand Pacific Hotel. The lobby at the hotel that was boarded up for 23 years before reopening five years ago. The Grand Pacific has 113 rooms, including 95 deluxe, superior and premier, eight royal club rooms and 10 royal suites. . Prices range from $FJ436 (about $283) per night for a park view room to $FJ1900 for royal suite 1. There is a swimming pool and gym, and a spa/sauna offering pampering treatments. . The hotel has two bars and its two restaurants are Prince Albert, with silver service, and the more affordable Leuvka, which is on the verandah and open all day.